The following is a list of all entries from the Uncategorized category. 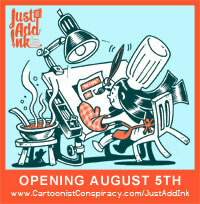 Just Add Ink is opening this Friday! I can’t wait! The International Cartoonist Conspiracy, and the artists involved in the Just Add Ink project. All artworks posted on the Just Add Ink blog are ©copyright the individual artists. Website and submission guide illustrations by Kevin Cannon.